This restaurant is 100% vegan - including the desserts! 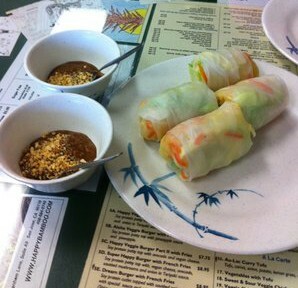 I personally had the summer rolls and the vegan caramel flan, which were absolutely delicious! The Happy Bamboo Vegetarian Cafe is one of the few restaurants with vegan Mexican options, complete with vegan sour cream and vegan cheese. And the corn tortillas are made with non-GMO corn! The owners are absolutely committed to sustainability and use local organic produce as much as possible. If you're looking for a good vegan restaurant in the San Jose area, give Happy Bamboo a try. They even have a vegan gluten-free menu! Note: they make everything to order, so if you have time constraints, you may want to call ahead. Let us know what you think about this awesome vegan friendly restaurant: Happy Bamboo Vegetarian Cafe in San Jose, CA. This is one of our favorite places to eat in the South Bay! There is SO much variety and they always use very fresh ingredients! It’s an excellent place to take omni friends or family, too!